You know how they say that the imagination is a powerful thing? Well, in my case, it seems to be a bit too powerful. 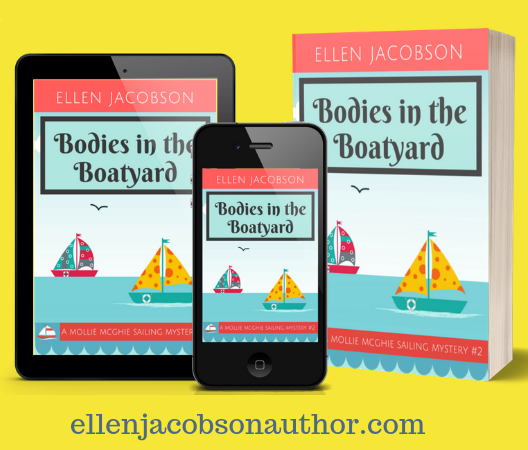 My cozy mystery, Bodies in the Boatyard, kicks off with Mollie and Scooter finding a leak on their sailboat and having to have their boat hauled out of the water and taken to the boatyard. Sounds great on paper, right? Trust me, it’s not so great in real life, especially when you live on your boat and it’s the only home you have. A few days ago we discovered a crack in the hull of our sailboat. A crack is bad enough. It’s even worse when it’s below the water line and letting water into your boat. Water on the outside of a boat, great. Water on the inside, not so great. So, like Mollie and Scooter, we’ve arranged to haul our boat out and move her into the boatyard to assess the damage and address it. That means that our plans to head off cruising to the Bahamas have had to be put on hold in the meantime. Hopefully, this is where the similarities end – fingers crossed we don’t stumble across any dead bodies in our boatyard. Here’s what it looked like last time we had our sailboat in the boatyard. This was right after we bought her when she used to be called Moody Blue. And here’s what she looks like when she’s happiest – in the water. Have you ever imagined something that’s come true in your life – good or bad? Only rarely, which is why i try to only imagine good things, so if they happen, i’m happy for them. Good luck, i hope the repairs needed are minimal and you get to head out soon. So sorry about your bad luck. When I saw the bottom of your boat, I could only wonder if you’re going to be a Smurf sometime soon too. Ah! But the good news is, you weren’t half-way across the Gulf Stream when you found that little issue!